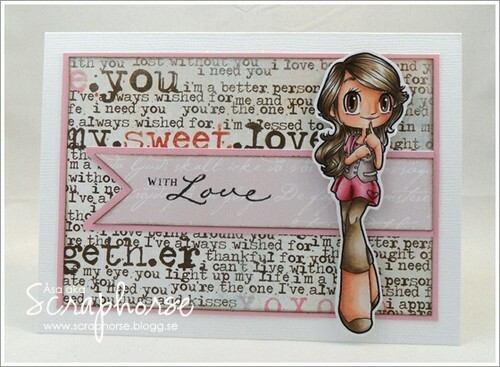 I have used wonderful Heartsy Mae with my all time favourite color combination brown and pink on the Twine!! Ok, who cossiped??! Thanks, anyway!! LOVE the twine! 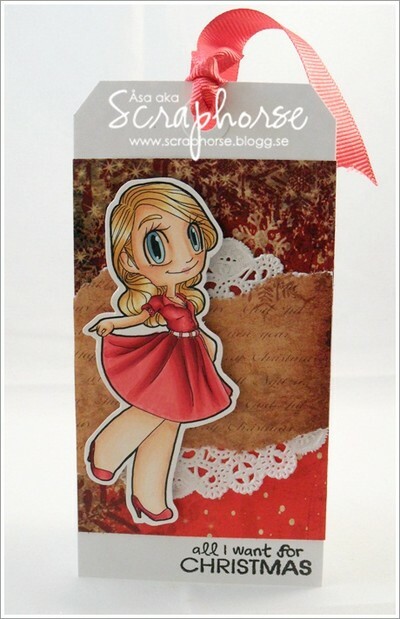 Asa: http://scraphorse.blogg.se <-- YOU ARE HERE! So there’s your hop list! You don’t have to visit everyone in order, but you do have to visit EVERYONE if you want to win the goodies! And that’s your cue, friends! Our winners will be announced on Monday, March 18th. Happy hopping, and GOOD LUCK! 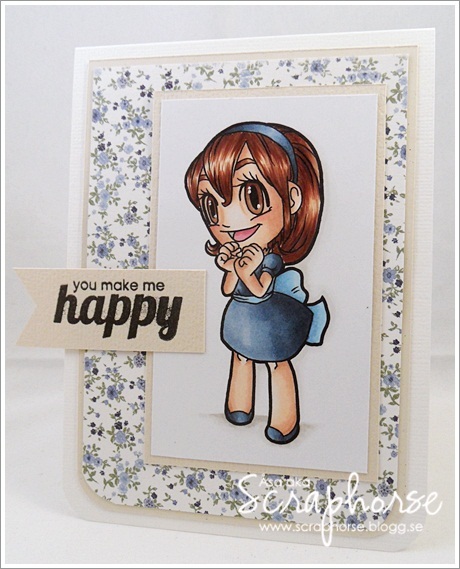 Today it's time for another fab sketch challenge over at Some Odd Girl! Our term is almost over, and I have discided not to go for another one. It's been a fantastic time, and you know I [LOVE] my SOGGIES!!! But there is a time for everything, and I have so much crafty assignements ahead, so Im going to be busy anyway. It's quite bright and colorful, for being me!! I have used wonderful Mae for this one, and colored her with Copics of course. Now don´t forget to hop on over to the SOG-Blog and watch out on all the eye candy from the amazing DT-team! Today Im showing a Valentine card for Some Odd Girl. Papers are from Inkido and Bo Bunny. The sentiment is from Stampavie. The edges are distressed with Walnut Stain. It´s time for another Fairy release at Some Odd Girl. 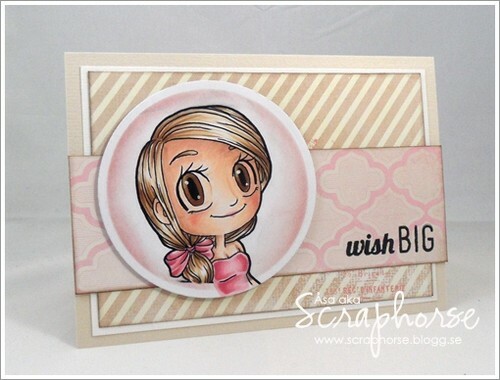 I've made a jumbo tag with my Tim Holtz die and some wonderful Pion and MME papers. They are all distressed with Walnut Stain. The border is made with a Martha Stuart punch. 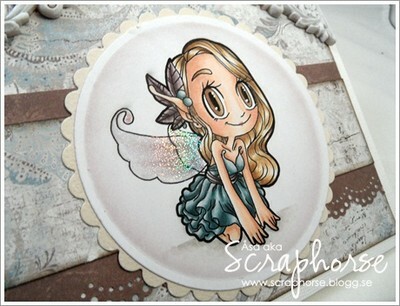 A little close up on the motif and sparkly wings. I hope you haven't missed my Speed Coloring Video in yesterdays post. There you can follow me coloring with my copics. Yes, can you believe, two postings at the same day!! 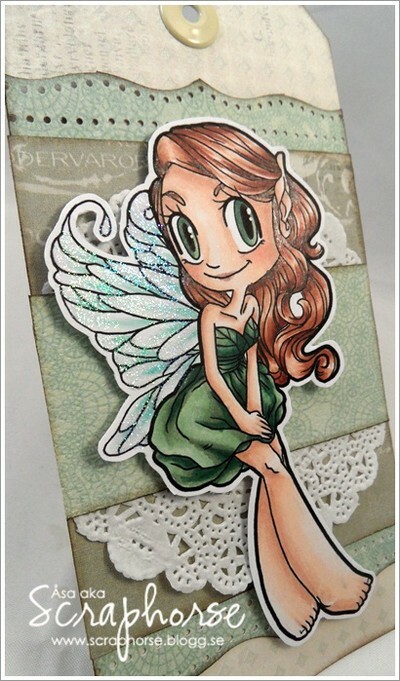 Some Odd Girl is having a wonderful Digi release this week - all in the theme of Fairys! I've done a very clean and simple card, with papers from Maja Design and Pion. Distressed the edges with Walnut Stain and added some wonderful Prima corners. Here comes a little close-up. Just wanted to show you the glittery wings. It's already February and is time fo another sketch challenge over at Some Odd Girl. This time I've used Thank You Mae (clearstamp). I´ve colored on Perfect Coloring Paper. Now jump on over and look at all the beautiful creations that the rest of the DT-ladies made!! Today it´s time for the last stamp from the new release at SOG. For those of you that were hopping with us in the weekend will recognize this one. I´ve used very soft and pale colors for her. I think it´s fits together nicely with the papers. I just love the little puppy! Hope you liked all the stamps. Don´t forget to comment in the SOG Blog to have a chance to win them all over to you! Today we keep on with another release from the new clear stamps over at Some Odd Girl. And I just love her in all that green. The image is colored with Copics on Perfect Coloring Paper. Welcome back tomorrow for another release. Hope you´ve joined all the celebrations at Some Odd Girl this weekend! Lots of hopping and lots of fun. And it doesn´t stop there, there will lots of more under the week. 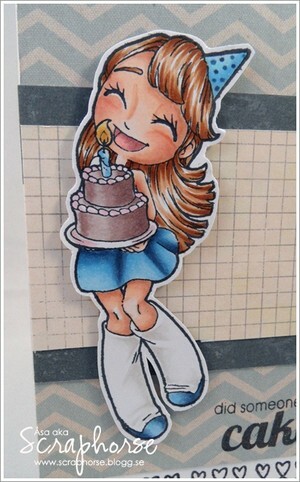 I´ve made a big birthday tag. The hearts and the sentiment is also from the same release. 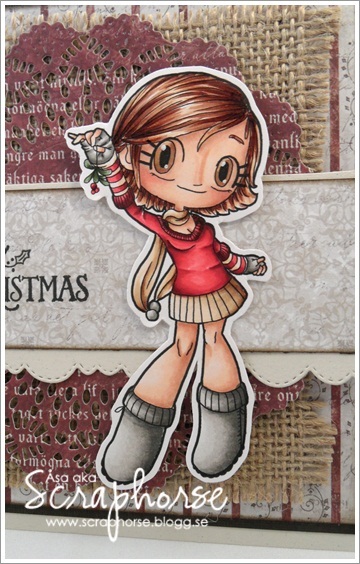 I´ve colored her with Copics on Perfect Coloring Paper. Be sure to be back tomorrow, for more new clear stamps. Welcome to Some Odd Girls January Birthday Party Release and Celebration Blog Hop! 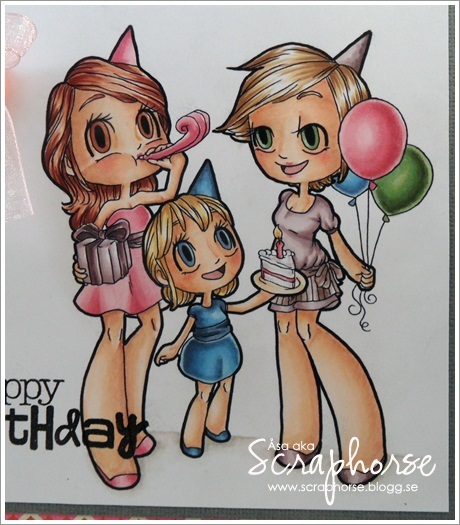 On January 18th Some Odd Girl is celebrating our 3rd Birthday and we are having a Party Themed Clear Stamp Release on Monday as part of the party. We’re kicking off the festivities today with a blog hop where you can see the release and be entered to win a set of your very own. 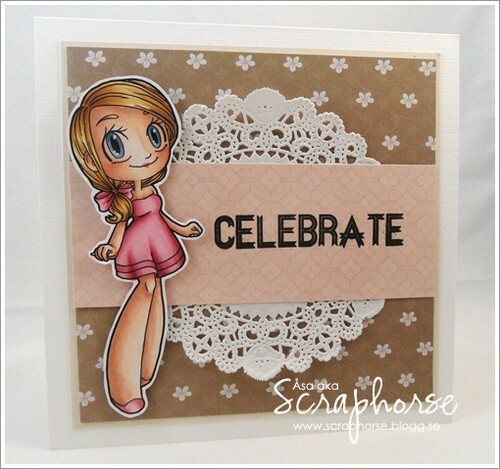 Kristy are releasing some new wonderful Clear Stamps next week I can tell you! And we are giving some sneaks through the Hop. I´ve used Puppy Love Mae, and colored her with my Copics. Papers from MME and Prima. Flowers from WOC. All edges are distressed with Walnut Stain. Isn´t she such a cutie. You might notice the last stop on our hop is something new, its something we’ve been working on getting ready and we’d love to introduce you to our new Community! Its the last stop of the hop and to get your entry there all you need to do is sign up. We have 3 new sets we’ll be giving away and 1 will be drawn from our new Community Members. We’ll also be using our community all next week to celebrate our birthday with games, challenges, contests and giveaways so stop by and get familiar. I can’t wait to see you there! Your next stop is Kristy. Today Im giving a few tips on how you can play and use your digital images in the SOG Blog. Jump on over there to get the full Tutorial. I´ve distressed with Walnut Stain and Victorian Velvet. Thank you for dropping by - please leave a comment, so I can pop by and si Hi to you too! Yes, back to work, school and kindergarden. It´s been nice with almost two weeks holiday, but I´ve could have been off a couple of weeks more I think. to put a little more focus on the image it self. Don´t forget that Some Odd Girl is heading up for the big Anniversary soon! Keep an eye on the blog, ´cause it´s going to be lots and lots of fun coming. Wow, two postings on the same day! And the first day of the new year. Well, it´s a new month and a new challenge over at Some Odd Girl. We are interpreting one of Kristy´s lovely sketches. 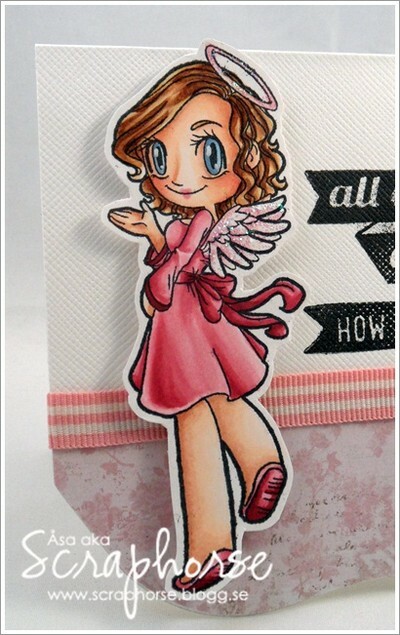 I´ve used my favourite clearstamp Angel Gwen and colored her with Copics. 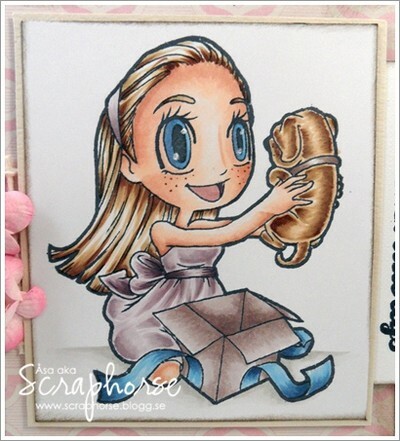 Don´t forget to check out all of the DT-girls amazing creations in the SOG-Blog. Have a wonderful first day of 2013! Wlecome back for another wonderful Digi Release from Some Odd Girl. This is my personal favourite from this release! I sure got a thing for wonderful Mae! Do you wan´t to win her over to your collection!?? Comment in the SOG Blog and you can! I will see you tomorrow again!! Some Odd Girl is having a fantastic Digi Release this week!! And today it´s Giddy Tia's turn. Tia is colored with Copics. Doesn´t she just make you all giggly?! 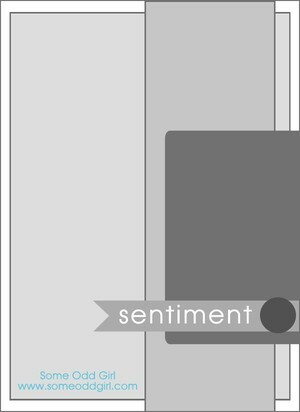 The card is very clean and simple, with rounded corners and papers from Maja Design. Don´t forget to comment in the SOG Blog to havea chance to win those lovely digi's! See you tomorrow again, with another wonderful release! 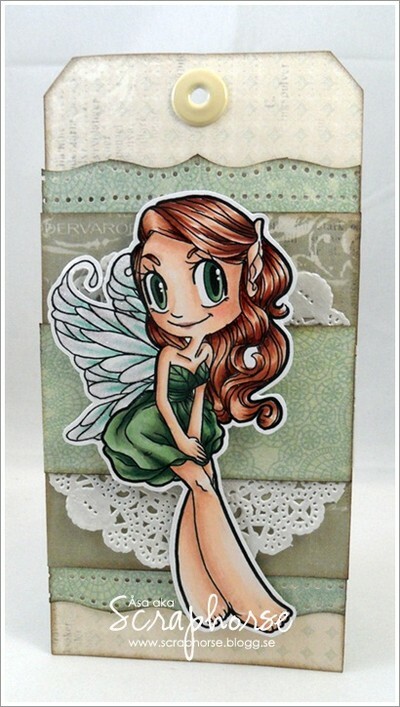 I´ve used Mistletoe Kaylee and pared her with papers from Maja Design and Jute. A close up on the wonderful image. 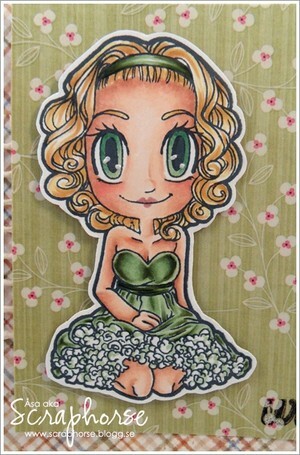 Kaylee is colored with Copics on 250 g Perfect Colouring Paper. 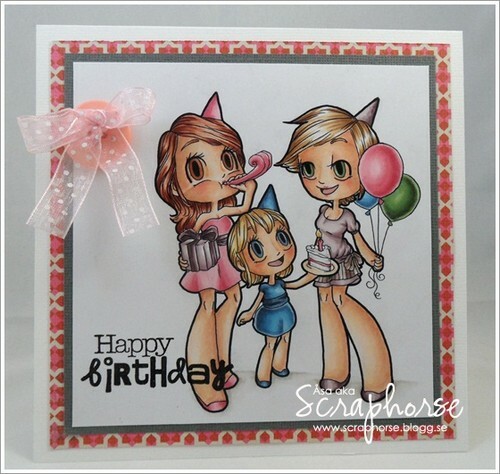 Now link up your SOG creations in the blog, and get the chance to win some awesome prizes! And don´t forget to peek on all the wonderful inspiration. Today Im spending my time on a cosy and wonderful crafting event. Crafting, eating (lots of it) and spending time with my wonderful friends. But - as it´s the 1st of December (Gosh time flies! ), it´s time for another challenge over at Some Odd Girl. Kristy has another of her lovely and inspiring sketches ready for us. and kept it clean and simple. Here´s a close up on lovely Gwen. Have a fantastic 1st Advent! Light lots of candles and bring out the first Christmas Decorations. Today there is something really new, and a bit Odd, over at Some Odd Girl! 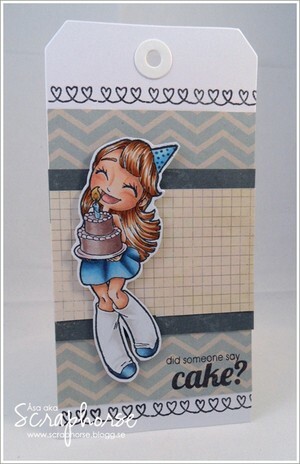 Kristy is releasing the coolest sentiment stamps ever! Well, I´ve used some of the sentiments and made a soft background, and paired it together with sweet Mae. 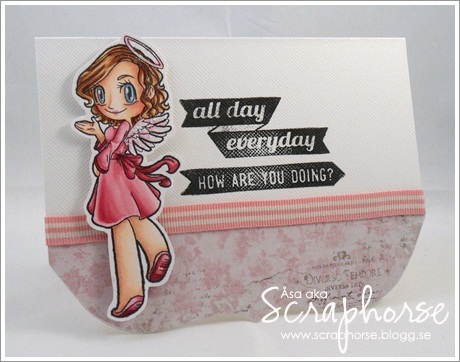 Now, you just have to hop over to the SOG Blog, there are some seriously wonderful creations in there!! It´s time for another sketch challenge over at Some Odd Girl. I´ve used Pink Ribbon Mae and colored her with Copics. 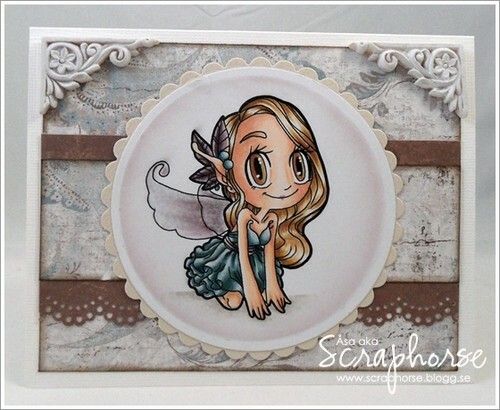 The papers are from Tim Holtz/Ranger and they are distressed with Walnut Stain. 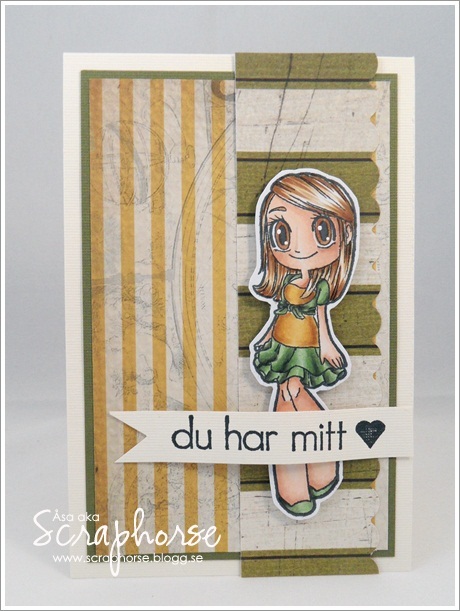 Now don´t forget to jump on over to SOG´s Blog and check out all the DT-girls amazing projects. Yepp! It´s time for 1950s Mae & 60s Mod Mae at Some Odd Girl today. This is my top favourite from this release! Colored with copics, and papers from Pion and MME. Don´t miss your chance on winning those cuties over in the SOG-Blog!